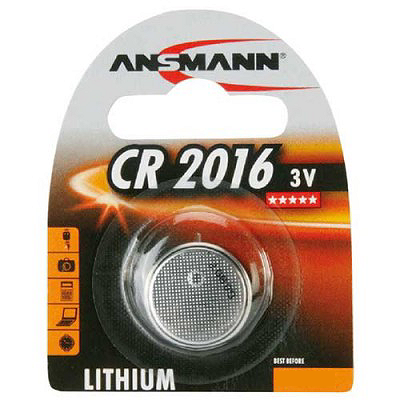 Ansmann CR2016 Batteries are among the most often chosen by consumers because they're a proven source of dependable power. This 3V CR2016 coin cell is a high-quality primary battery for your heart rate or glucose monitor, key fob or other comapatible devices. It is a direct replacement for these batteries: 280-202, 280-204, 280-206, 5000LC, BR2016, DL2016, SB-T11, ECR2016. Thanks to lithium chemistry, this battery performs reliably in temperatures from -30C to 60C. It's extremely lightweight and has a very low self-discharge rate, giving it a shelf life of up to 8 years, so you can have plenty of spares on hand.